When I was a postgrad student many years ago, the group was loaned demo unit of a very expensive thermal transfer printer. It wasn't so much that the printer was expensive but the consumables were. For each A3 page it fed through 3 full sheets (CMY) of transfer material, and melted parts of each of them on to the page. The results were A3 photo-quality glossy prints that looked way better than anything you'd find outside a photo-lab even today. Back then colour printers barely existed. So what did we do with this? Now days you'd download some cool images and print them, but the web and even jpeg wouldn't appear for another year or two. 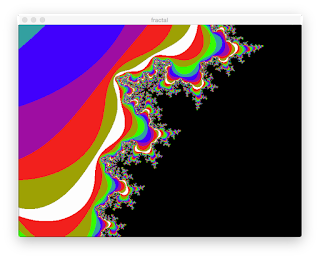 What we did have were some fast (for their day) parallel computers, and so we printed a few mandelbrot sets. This happened to be just around the time of the big campus open day when thousands of 6th formers visited campus to be wow'ed by the tech on show... and we were asked if we had anything to show? Show? we could go one better. Not only could we show of your super fast parallel computer drawing Mandelbot's, we could sell them prints to take home! We sold dozens for £1 each. To be fair we weren't exploiting the kids - they got a great deal. The prints looked amazing, and those rolls of thermal transfer sheets were crazy expensive. If we'd been paying for the materials we'd have been loosing several pounds on each image, but you know how it is - we were engineering students, tripped out on high powered computers, and we had the demo printer to the end of the week! So I wrote a Postscript program to print a black rectangle that filled the whole page, while someone else rewound the whole roll of transfer material back onto the original spool and put it back in the printer!!! We print the black page and all of the remaining transfer material is dumped onto the page, and we get a negative of the original print - or as we're just printing Mandelbrots, a new print with different colour scheme. The new batch of prints didn't look quite as good, as the colour schemes weren't what we would have chosen, and the registration was a fraction off, but they still looked pretty amazing, so we sold the second batch for 50p. Apparently the sales rep was a little shocked when he collected the demo printer, and discovered we'd used all the transfer film. He was even more surprised to find we'd used all the transfer film - every single last pixel of it! We have a value Z, we square it and add something to it, and that gives us a new value for Z. We start with Z=0 and use the coordinates of the pixel as the value for C. We repeat this until Z "gets big", and count how long it takes to get big - if it never gets big, then its "in the set", and we colour bit black. Otherwise we colour it based on how long it took to get big. And here it is in Sniff. We loop over every pixel in a window (640 by 480), and based on that pixel we calculate a value for C (Cr from -2 to + 2, Ci slightly less, but with the same scale so it stays square). 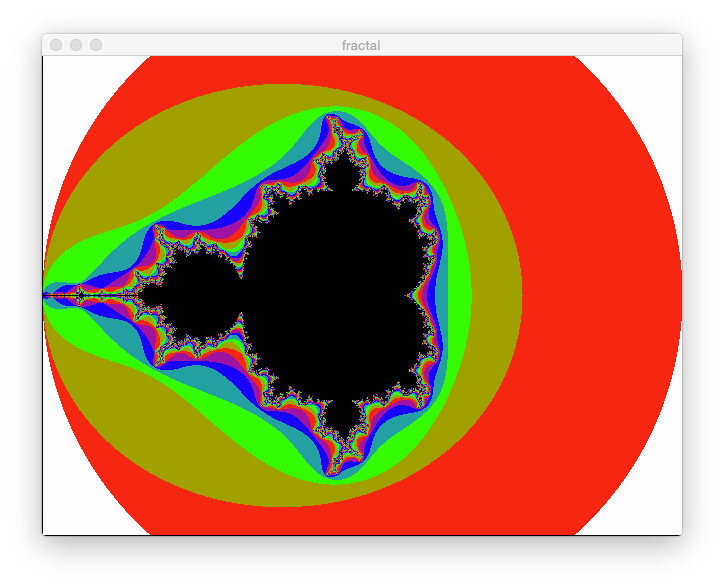 Then we initialise Z to 0, and iterate round calculating Z'. We stop when Z*Z>4 as once we go outside this circle Z gets very big very quick and we can stop counting. We keep a count of how many times we've been around, and use that to pick a colour. The coloured points are outside the set, but they show how close we're getting. To make things nice and simple I created a list of colours, so you can fill in any colours you like - my colour scheme isn't very inventive When we run out of colours to use, we give up, and colour it black. 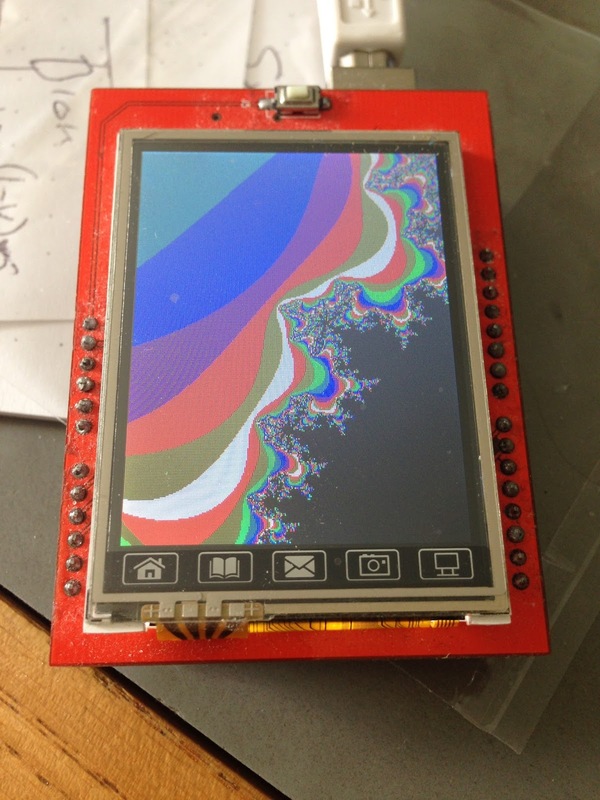 And of course to get it running on Arduino, just change the "window" device to be a "tft", device. By co-incidence the 320x240 screen is pretty close to the resolution of the BBC micro Mode 1 screen that I first ran this sort of code on. The difference is that the BBC Micro took hours to generate this kind of image, while even an Arduino can do it in a minute or two. On a PC at 640x480 it takes only a second! I used pins 7 and 8 for absolutly no reason at all. The first thing we'll do is turn the trigger off, and wait 1 second for everything to settle down, and power up correctly. Then the trigger pin turns off the device emits a series of 8 high pitch clicks. We need to wait for the echo pin to go high, indicating that the pulses have been sent, and record the start time. We then wait for echo to turn off again, and that gives us the end time. In Sniff (and Scratch) we access the time since the program started using the "timer" block. However there's a gotcha - accurate timers are tricky. Sometimes we want to measure time in days (like when we collected the temperature data from the pond), and sometimes (like here) we want to measure things in microseconds. That's a range of 11 orders of magnitude, which causes some technical problems. To handle that as reliably and flexably as possible Sniff has two timers. The regular timer, which we use for normal stuff, and a special "fasttimer" when we want to measure small time periods accuratly (basically timer is only accurate to 1mS, while fastTimer operates at a microSecond level). Here we're measuring a small time interval and want it to be super accurate so we're using fasttimer. Here we'll settle on a typical value of 340m/s. So we multiply the time taken, by the speed to get the distance travelled. Of course the sound travels to the object and back again, so we half the distance travelled by the audio pulses to get the distance to the object. Easy!! 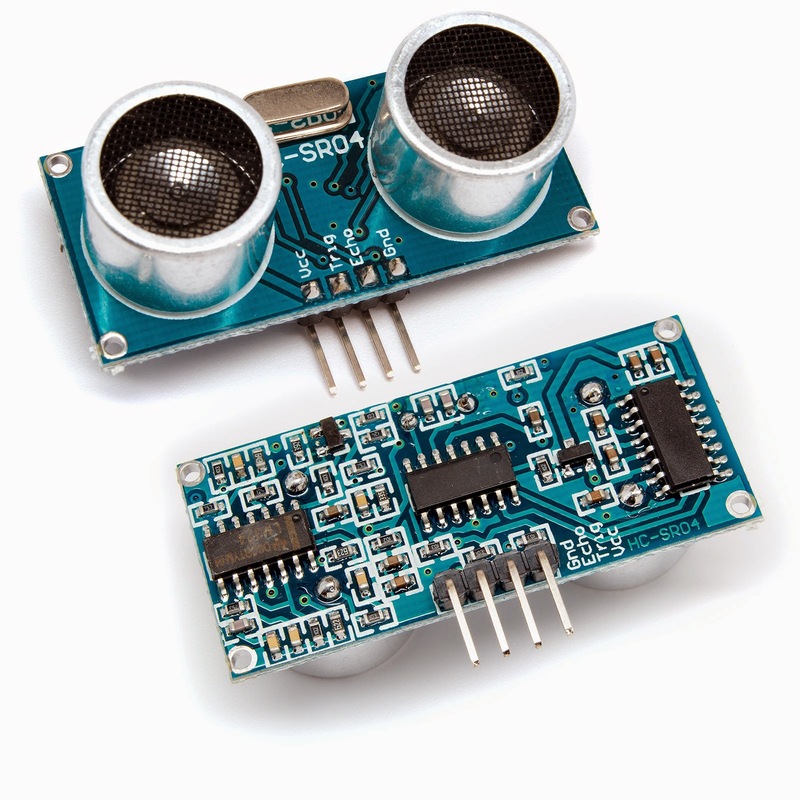 It's in a loop, printing out the result to the serial terminal, but you could just as easily use an embedded display to make a portable, ultrasonic tape measure! When it works the results are remarkably consistent and accurate - unlike an IR distance sensor its not measuring the intensity of the reflection, but rather the timing, so it doesn't matter of objects are big or small, light or dark. If you've read through Lego's intro to wedo material (and the related simple mechanical machines) you'll find its an excellent introduction to gearing and ratios. Using a big and a small cog you get taught how to speed up, slow down and reverse the direction of rotation from either a hand crank or a motor. But that section of the material doesn't actually use the Wedo... perhaps we could use it to put some numbers on those observations! 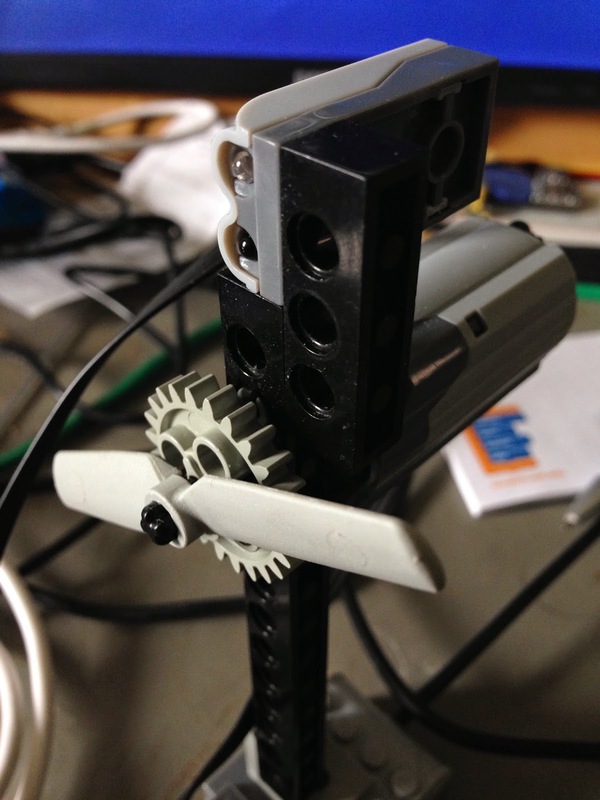 How fast does a lego motor actually turn, and do the gear ratio's do what they're supposed to? This just turns the motor off, and prints out the reading from the sensor. Turning the blades slowly by hand shows that the value reported by the sensor does change. While we don't really care about the exact value, we can detect that the blade passes in front of the sensor when the value drops below 0.1. Now we can check to see if there's a blade present - wait until there isn't (print ping), wait until there isn't (print pong). As the motor turns we're not tracking its rotation. Now we just measure the time it takes us to go around the loop. 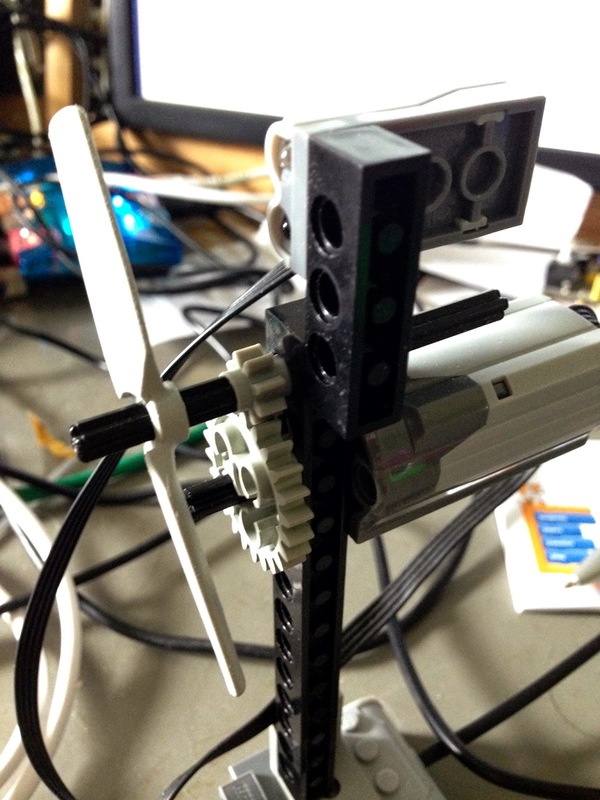 As there are two blades to the propeller, each iteration represents half a turn. A full turn takes twice that. We could print that out as time per revolution, but if we take the reciprocal that gives us revolutions per second. Theres a bit of variation, as the wedo probably only updates the reported value on a periodic basis, but the results are fairly consistent and representative. In each case the new speed is almost exactly three times the previous one... The exception to that is the 0.75 which is a little low... However looking at the raw data for this particular measurement, it seemed to present the most variation 6.94 was the most common reading, but it was also the lowest, with occasional readings of 7.6 and 7.9 - no other reading had any where near such a wide variation, so it looks like this speed doesn't mesh well with the underlying sampling rate - lets just put it down to experimental error. Now the moment of truth... Lets count the number of teeth on the cogs: The small one has 8, while the big one has 24... a factor of THREE!!!! One turn of the big cog turns the little cog three times, so the blade spins three times faster. The Lego Wedo is awesome! It comes with a great set lesson plans, with lots of great projects, and ideas for how you can use the items you build as part of larger topics. However they're firmly aimed at KS2, which is a great shame as everyone loves Logo and having bought expensive hardware, far too many schools use it for a few sessions in year 4, then put it back in the cupboard. 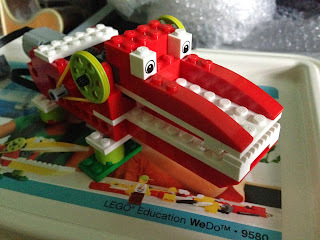 The Wedo software is nice but limited and expensive, and its probably the main reason that Lego haven't made the Wedo available outside of primary education. Fortunately the Wedo works with Scratch and Sniff. This means there's lots of opportunity for frameworking and progression: we can revisit familiar (and fun) projects which have been completed in the Wedo Software, and rebuild them in Scratch and subsequently Sniff. We start by making a wedo hub device. You can connect any number of hubs (more or less! ), but we're just going to have one. Each hub as two connectors, and we've plugged the motor into connector 1 (the left 1). We set the wedoConnector and wedoValue, and the tell the wedo to "setMotorSpeed". -1 closes the mouth, while +1 opens it (that's just the way this model is built/geared), so this code closes the mouth, then opens it, repeating forever. We close for slightly longer than we open to ensure that the jaws fully close - the drive bands will slip when we get that far. Having got the jaws snapping, we can move that into a separate script. It's impossible not to love this guy! Just leave him sitting on your desk, and feed him occasionally! If you've got some Wedo kicking around from working with younger year groups, then get them out, and get excited about building and programming! Release 17 contains a lot of minor improvements to the compiler and runtime that should make it nicer to use. Programs now quit once all scripts have completed, and the compiler will now warn you if your program contains scripts and/or broadcasts that are never used (typically because you've miss-spelled one of the script names). The big headline feature is that Wedo is now supported on all host platforms: Windows, Linux and Mac. This has been a priority for some time, but the code needed to support it was complex. Now its in place everything should just work. Wedo was the last Unix only feature, and now windows and Unix platforms are basically equivalently supported. There are of course the usual round of bug fixes, and examples, including all the numerical code from the last few blog posts, and the multi shield Arduino code. update: There was a minor, but quite obvious bug in the Unix release, which has been updated. Last year we put a lot of effort into getting the core of Sniff right. It's now a solid programming system, with a rich set of libraries, running on a wide range of platforms. We're not working with teachers to iron out the wrinkles and make it easy to use for non-techies. Sniff is essentially command line based, with a compile command which generates an executable. You can use it with any IDE, or simply a text editor. To make things easier for new users we wrote SniffPad - a simple IDE for Sniff, written in Sniff. However as that's a Sniff program you generally need to run it from the command line. To make it even easer, on a Raspberry Pi or other Linux system you can make a desktop shortcut to Sniffpad, so users can just click the icon, and just straight into writing Sniff code. You'll need to edit the Icon and Exec lines to point wherever you've installed Sniff. In this case I've unpacked the Sniff distribution into /home/ian/Sniff. In future releases that's all you'll need to do, but if you want to try this out right now, then you need to go to the Snif/utils directory and make a folder called PiShortcut. Inside there put an image file sniff.bmp. Finally we need a script which is actually going to run. We can't link directly to SniffPad, as we first need to set up the Sniff environment. Place the following text in a file called runSniffpad inside the PiShortcut folder, and make sure its executable (chmod 755 runSniffpad). This finds the Sniff folder based on where the runSniffPad command is, and runs setup. It then cd's to a folder called SniffProjects, where you can save your work. Now just double click and you're good to go!